Thanks to Marie Kondo, everyone knows about the Japanese art of katazuke, or “tidying up.” Kondo’s books on organizing your things and deciding what items you should throw away have been translated into numerous languages and she’s been interviewed by myriad international media outlets. Katazuke has an evil twin called “hoarding,” an acknowledged psychological condition that describes how individuals cannot let go of possessions, no matter how inessential. The American reality show “Hoarders” has been a staple on American cable TV off-and-on for about a decade. Experts visit junk-filled homes and attempt to sort out their owners’ lives. In Japan, such TV shows are also very popular. 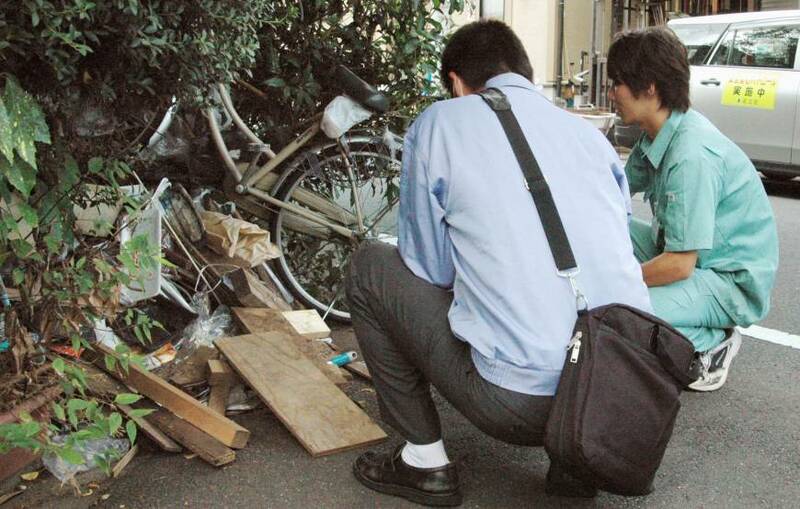 Titles sometimes incorporate the word “gomi-yashiki,” meaning “garbage house.” On May 16, NHK ran a report on “garbage apartments” occupied by single people. In the cases cited, the individuals are faced with stressful situations that manifest as total neglect of their personal space. Their apartments fill up with junk to the point where they can’t even move around. Experts say this behavior is the product of loneliness and forced “individualism.” Without the balancing effect of social interaction, people can fall into patterns of apathy that lead to depression. However, hoarding is not always a sign of anxiety. Another word that pops up in relation to messy homes is “danshari,” a neologism coined by the woman who popularized the katazuke movement. Hideko Yamashita has been a consultant longer than Kondo has. The word danshari incorporates three Chinese characters taken from yoga teachings: “dan,” which means “to prohibit,” “sha,” which stands for “the disposal of unnecessary things,” and “ri,” which implies “leaving obsessions behind.” But if the word turns katazuke into a philosophy, Yamashita’s methods are practical to a fault. BS Asahi airs an occasional series dedicated to Yamashita’s ministrations called “Uchi, Danshari Shimashita!” People with hoarding or storage problems write to the producers and ask for Yamashita’s help. She shows up with a video crew and surveys the damage, explains to the subject how her methods can solve their problem and leaves, promising to come back in several weeks to see how well the person carried out her advice. The crew, however, hangs around. The most recent episode featured a 47-year-old woman who lives in a four-bedroom house in Chiba Prefecture with her husband and two children. The woman works a part-time job two days a week and says she doesn’t have time to sort through the clutter, and when she does she is overcome with indecision because she believes some of these things “might be useful someday.” Yamashita has heard it before, but unlike Kondo, who approaches the matter from the positive side — which things do you love? — Yamashita starts off by telling the woman she must figure out how much she should reduce to live comfortably: When in doubt, toss it out. Left to their own devices, the people on “Danshari” rarely get that concept initially and usually require intervention by Yamashita or the video crew to actually start putting things in garbage bags. In another segment, a 54-year-old woman who lives in the penthouse of a condo in Tokyo’s Shinjuku district she owns tries to cloak her indecision by transferring junk to her bathroom so that when Yamashita returns it looks as if she’d done something. The video crew rats her out. Unlike the NHK program, all “Danshari” segments have happy endings in that some semblance of normality is achieved, but it’s easy to imagine the situation backsliding. The majority of subjects are women whose live-in male relatives, be they husbands or fathers, tend to not get involved. Katazuke is an issue of housekeeping, which is still mostly a female concern. Another contributing aspect is the usual design of many Japanese houses, which often lack sufficient storage space. Closets are smaller. Anything that doesn’t fit ends up on the floor. A different program, TBS’ “Jikka o Katazuke te Mimasen ka?” (“Shall We Try to Tidy Up Your Family Home?”), offered a better idea of why such variety shows will not soon disappear. The focus is houses where people grew up and now want to put into order, meaning they don’t necessarily live there anymore but their parents still do. In all three cases shown, the parents are boomers, the first generation of Japanese to acquire stuff indiscriminately. Their children recognize the clutter and want them to set their affairs in order before they die. One of the cases focused on the man of the house. A woman requested help in cleaning up her father’s home in Saitama. The woman’s mother is an invalid, and her father takes good care of her but is averse to cleaning up after himself. The house is not just cluttered but old and filthy. A proud student leftist in his day, he doesn’t suffer from the usual neuroses associated with hoarders. He just has a higher tolerance for disorder. After his daughter forces him to clean up with the help of the production crew, refuse collectors haul away 2 tons of junk. The other two cases were more about specific circumstances than psychology. Former idol singer Tomomi Nishimura helped her parents clean up their house in Yamaguchi Prefecture, which didn’t look like a garbage house because they had lots of storage space, but they discarded 6 tons. Three sisters, two of whom fled their Kyoto home as soon as they could because of their mother’s hoarding, marched in and forced her to dump lots of things. The mother obviously suffers from an obsessive-compulsive disorder, but she also grew up in a well-to-do home and was never expected to clean house until she married. Say what you will about her uncooperative husband. Hoarding is not informed by a uniform set of personality traits and, as presented by commercial TV, it isn’t as dark as NHK makes it out to be. However, it’s important to remember that these people asked to be on TV in the first place. There may have been an impulse at work other than seeking help.